The year was 1984. This was the year that hip hop, still in it's juvenile years, was given a true classic that was a part of forming hip hop into what it is today. This was the year that T LA Rock dropped the single It's Yours with the help of Def Jam co founder Rick Ruben. The single actually dropped on Arthur Baker's independent label, Partytime, which was a division of Streetwise Records. With hip hop still in it's early years, It's Yours stood out as an underground masterpiece that would point hip hop in a completely new direction, both with production as well as lyrically. 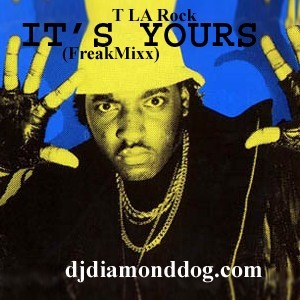 You can sample It's Yours (FreakMixx) right here and at djdiamonddog.com. It contains a mean sample from the iconic dancehall track, Murder She Wrote by Chaka Demus & Pliers and Freaks by French Montana. Be sure to download this one for your collection right here. This remix brings together the best of both worlds, separated by nearly 30 years! !